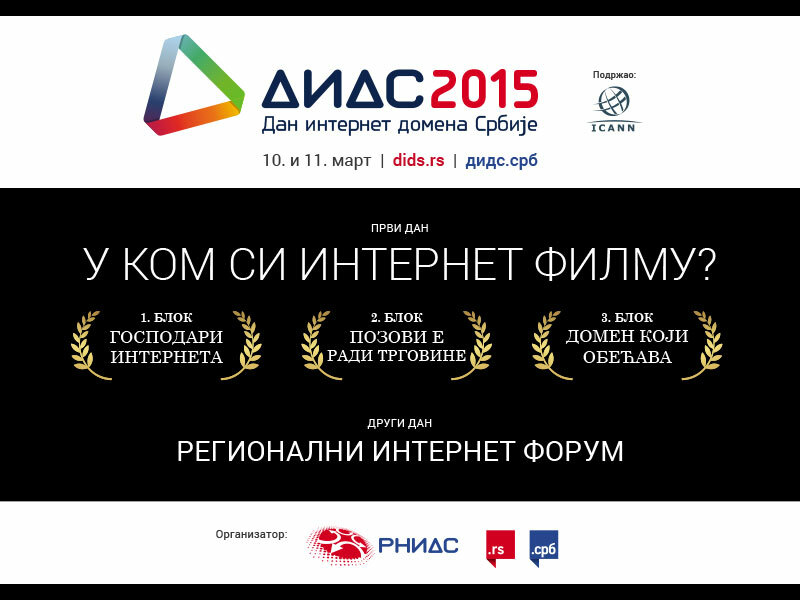 DIDS | DIDS 2015 – Which Internet film are you in? DIDS 2015 – Which Internet film are you in? This year’s DIDS conference, organised by the Serbian National Internet Domain Registry Foundation (RNIDS) and to be held 10th and 11th March 2015 at the Metropol Palace hotel in Belgrade, will bear the slogan “Which Internet film are you in?” This sixth annual conference on the development of the Internet worldwide and on the .RS and .СРБ domains in Serbia will this time be held over two days, the first day being a regular programme for registered participants and the second day a regional professional Internet event for invitees. What sets this year’s DIDS apart is the support it will receive from ICANN (the Internet Corporation for Assigned Names and Numbers), the lead organisation for the administration of the Internet and its global structure. The second day of DIDS, on 11th March, will host the Regional Internet Forum, which will bring together representatives of the national registries of Greece, Bulgaria, Macedonia, Romania, Croatia, Slovenia, Bosnia and Herzegovina, Montenegro and Serbia, as well as representatives of state institutions, local Internet communities and global Internet organisations. The first block, moderated by Vojislav Rodić, will comprise both a presentation of regional Internet activities and a preparatory meeting for the forthcoming EuroDIG conference in Sophia. Moderator of the second block will be Slobodan Marković, with a discussion on the application of the multi-stakeholder model in the administration of Internet organisations in the region. The third block will comprise discussion of the use of local writing systems on the Internet and technical issues faced by Internet registries, moderated by Dušan Stojičević.